Just 350 tickets were going on sale for the event with the band informing people of their plans with a message on Twitter. Fans will pay just £12 - a huge contrast to the £375 many had to shell out when tickets went on sale last week for a pair of gigs at London's O2 Arena to mark the band's 50th anniversary. Within hours of being snapped up, tickets were exchanging hands online for thousands of pounds with some going for up to £12,000. 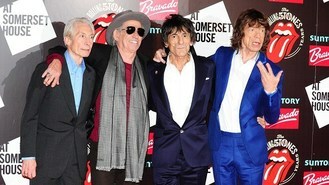 Fans were told this morning: "The Rolling Stones are playing a short warm-up gig tonight, Thursday 25th Oct, in Paris." The message went on to say tickets will be available at the Virgin Megastore on the Champs-Elysees at midday. Ticket-holders will be given a wristband when they arrive at the mystery venue this evening. The concerts are the band's first since their Bigger Bang tour ground to a halt in 2007. Gig-goers were warned: "Mobile phones, cameras, video equipment and recording devices are strictly prohibited." The Stones have been rehearsing in Paris in recent weeks. They are about to release another greatest hits album which includes two new tracks, including Doom And Gloom, which last week peaked at number 97 in the Official Singles Chart. Despite the clamour for gig tickets Doom And Gloom - which cost 99p to download - was the group's worst chart performance for a new single.